This interdisciplinary and collaborative research project explores community-based drinking water management in Nicaragua’s rural areas in the context of climate change. In particular, we examine how subjective perceptions of climate change affect societal decision-making on the part of non-state environmental managers, and explore how grassroots actors both are affected by as well as push forward responses to this phenomenon at “higher” political scales. Collaborators in Nicaragua include the Central American University (UCA) and the Center for Water Resources Research at the National Autonomous University of Nicaragua (CIRA-UNAN). Across Latin America, legal recognition of nonstate water management regimes continues to be a sought after strategy for updating and improving rural water sectors. However, our understanding of the conditions under which this kind of policy proves effective in water management and access terms is lagging, both empirically and theoretically. Further research, spanning irrigation and drinking water regimes, will strenghten our understanding of this policy trend. Drawing comparisons between and among Bolivia, Costa Rica, Ecuador, Nicaragua, and Peru, this research demonstrates the importance of looking “beyond the laws” to understand the intersection of policy and legal frameworks with water management practices, state-society relations, and environmental change in Latin America. The political conflicts surrounding hydraulic fracturing reflect struggles over legitimate sites of authority and decision-making. To date, the political processes informing and contextualizing these industrial operations have received less scholarly attention than the health, safety, and environmental impacts of fracking. This research contributes to our understanding of how fracking’s potential impacts prompt social mobilization and voicing of citizens’ concerns. In particular, we focus on institutions of higher education as sites of organized responses to fracking on the part of faculty, staff, and students. This project demonstrates the inherent risks as well as opportunities presented by universities’ leasing of their mineral rights. For example, we highlight (forthcoming 2018) the implications of increased university corporatization via mineral leasing as not only potentially beneficial in regard to revenue, but also risky in terms of student recruitment and retention. Funded by Fulbright, the UC Pacific Rim Research Program, and the UC Chicano/Latino Research Center, this project examined how community-based water committees in Nicaragua transcended their rural localities and roles as resource managers in order to engage in fundamentally new forms of political engagement, advocacy, and networking. These dynamics have unfolded in an unlikely context: one of extreme political polarization and state attempts at cooptation via new mechanisms of “direct democracy” at the subnational level. 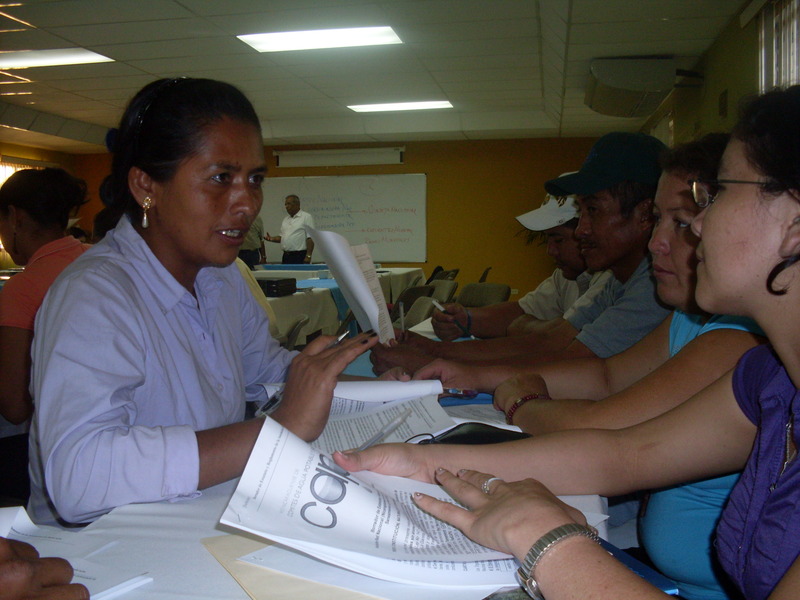 Based upon 13 months of field research in Nicaragua, this project examined the puzzle of how water committees collectively asserted themselves across political scales while maintaining a broad, pluralistic base and relative autonomy from the state—even as the state sought to incorporate civil society actors into partisan channels of citizen participation from above. This research has culminated in a book project, From Resource Management to Political Activism: Confronting Exclusion and Building Alliances for Rural Water Governance in Nicaragua, currently under review. Red Nicaragüense de Comités de Agua Potable y Saneamiento (Nicaraguan Network of Potable Water and Sanitation Committees, or CAPS). Discussing draft by-laws needed for soliciting legal status as a national level association (February 2010, Managua, Nicaragua). Dissertation in English: From Resource Management to Political Activism: Civil Society Participation in Nicaragua’s Rural Water Governance. What is surprising given the discrediting of privatization as a policy “solution” both among citizens and in many cases governments across the Global South is the relatively little attention to what policy alternatives have been crafted and implemented. Commissioned by the Municipal Services Project, The Cupboard is Full: Public Finance for Public Services in the Global South (2012) exami nes Public Pension Funds and Sovereign Wealth Funds as a potential sources of financing for public service provision in the Global South. In Nicaragua, research from 2004-08 examined resistance to the commercialization of a public water supply and the role of civil society in new policy formation. A report based upon the start of this movement (written for Public Citizen, now hosted by Food & Water Watch) can be found here. Findings are also published in The Bulletin of Latin American Research. This research expands existing understandings of popular sectors’ role in co-produced service provision, national and subnational policy processes, and ongoing processes of democratization. This project, funded by the National Science Foundation, culminated in a two-day (35-person) workshop entitled “Multi-Scalar & Cross-Disciplinary Approaches towards Equitable Water Governance,” held at UC Santa Cruz in February of 2013. The workshop brought together an interdisciplinary, international team of social scientists and scholar-activists towards achieving the goal of developing a multi-scalar and cross-disciplinary theoretical framework for understanding equity within water governance. Addressing the limitations in water-focused scholarship to date, we aimed to bridge disparate disciplinary agendas and integrate greater attention to dynamics, actors and institutions at multiple scales (temporal, geographic, social, political) in order to produce more empirically- and theoretically-grounded approaches to studying and understanding equity/inequity in this complex realm of policy and practice.